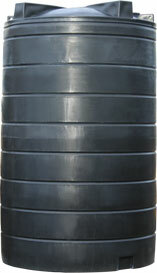 This 25,000 Litre Fertilizer Tank is made from a Medium Density Polymer (MDP). It comes with a 10 year guarantee. Larger tanks come with positive tie down points for easy handling and positioning. Std colour is black, however natural is also an option for the same price. Tank comes with a 10 year guarantee.